I've been holding off on this one for awhile. My early years were spent in Mitchell, South Dakota, and most dinners consisted of pot roast or chicken parts with cooked, frozen vegetables and mashed potatoes. When the family moved to California in my tween years, the Campbell's soup menu was in full force. 1000 ways to make an economical casserole with 1# of hamburger and a can of Campbell's soup. We were poor, so my mother embraced this fully. The one we ate most and despite everything I still miss? Tater Tot Casserole. Pot Roast was relegated to family dinners on Sunday. To say my culinary experience was limited is an understatement! When I decided to nest last December and head back to the kitchen, one recipe that intrigued me was Paella. There is a great write-up on Wikipedia that covers the history, the types of paella and actually includes three classic recipes. 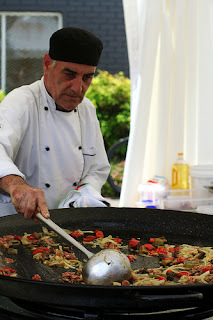 I highly recommend looking at this first - http://en.wikipedia.org/wiki/Paella. 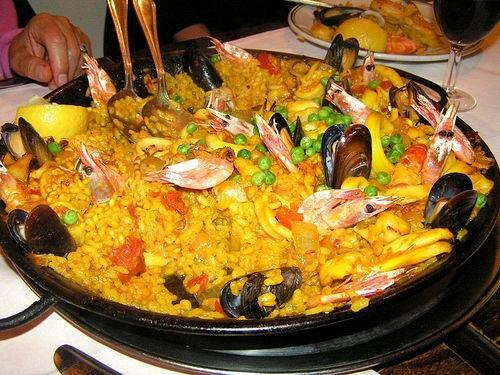 A quick overview includes the fact that there are three traditional types of paella - Valencian, seafood and mixed. Traditional ingredients include: Italian rice, saffron and olive oil. Another important fact for those that want to create a true Paella is that a layer of toasted rice should be found at the bottom of the pan. This is considered a delicacy in Spain and is essential. I chose not to worry about any of this as I wasn't trying to be authentic, but come up with a new taste treat for my family that they would all eat. a "no face, no blood, no bugs in houses" (prawns, shellfish, etc.) rule, but I felt I could come up with an adaptation that would fit my requirements and that my family would eat. The first problem was the pan. 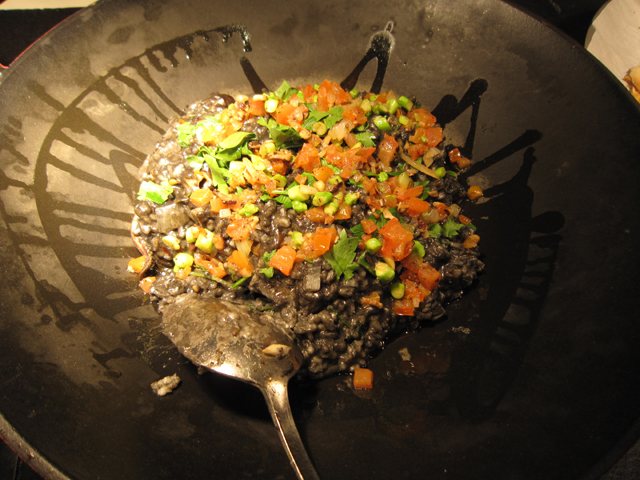 A proper paella pan can be expensive and hard to find. In a trip to Canadian Tire I lucked into a huge sale on T-Fal pots and found one that would work for me -the T-Fal Jumbo with lid. It was also the exact same diameter as one of my burners - a real plus for even heat. Then I needed a starting point. I found a basic recipe through a web search I felt would adapt beautifully to my changes. I chose to add things my family and I would enjoy - chicken, sausage and the smaller scallops. For the chicken, you can cook up a couple of chicken breasts or use the pre-cooked chicken found in the meat department at most grocery stores. For the sausage, I chose to use Jimmy Dean's fully cooked breakfast sausage, but you could substitute anything your family likes from mild to spicy. The scallops can be frozen or fresh, small or large, depending on what you like. All meat should be browned in a non-stick skillet ahead of time. Avoid the oil and you up the healthy value of the dish. The last issue I faced was finding saffron. There is a lot of debate as to how much flavour this adds and what proper substitutes would be, but I wanted to keep this traditional element. I finally found it locally behind the counter at Galloways which stocks lots of exotic herbs. So check your local listings for gourmet stores that stock herbs and call ahead of time to make sure they have it. Sorry, not a picture of my dish - food hits the table fast here! Here is the final recipe I came up with. Be sure and adapt it to your own personal preferences, don't be afraid to experiment. I am now working on a vegetarian version for get-togethers. The vegetarians in the crowd can eat as is and the meat eaters can use it as a side dish - the best of both worlds. Enjoy! Place saffron in a small bowl, add 2 tablespoons (25 mL) of boiling water and steep 5 minutes. Place oil in a Large skillet over big burner (even heat is essential). Add onion, bell pepper, mushrooms and garlic, cook 3 to 4 minutes. Add tomato, paprika and cook 3 to 4 minutes longer or until mixture is very tender and almost sticky. Add stock, rice, steeped saffron, salt and pepper. Simmer covered over medium-low for 20 minutes, or until the rice is firm/tender and still slightly wet (add a little more stock if it is not). While rice is cooking, brown sausages in a non-stick pan the remove to paper towel to drain. Add scallops and brown in same pan in sausage juices. Remove to paper towel and drain. Just before rice is finished cooking add sausage, chicken, scallops and fozen peas to pan. Gently stir and cover. Let cook a couple of minutes more, then let rest a few minutes before serving. It can be garnished with lemon wedges if you like. p.s. 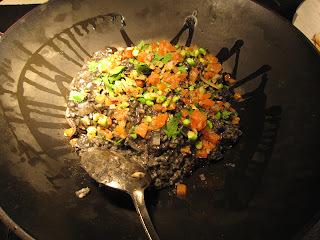 Epicurean has a recipe that also looks amazing if you want another option - http://recipes.epicurean.com/recipe/18969/paella.html.